There is one particular uruk-hai in both book and movie. He was entrusted by Saruman with a task of capturing the hobbits and the One Ring and bringing them to Isengard. As Isengard does not happen to have a wide list of heroes, one more hero might not be a bad addition to it. What really troubles us is his exact function and spells he may have. If we ever find appropriate ideas concerning him, then we'd likely add Ugluk to the game. What do you think about this? I completely agree with this idea. The Isengard faction has always really suffered when it came to heroes for this faction, granted that not a whole lot are mentioned in either the movie or the book. I do concur that Ugluk would be a great addition and add a new perspective on the Uruks of Isengard. With many people, such as myself, that are familiar with mods in both BFME 1 and BFME 2 there are a couple of mods that have Ugluk in them before and they have done a good job with them. If the powers and abilities of the other Isengard heroes are consistent to how they were in say... BFME 2 for example, then Isengard is really lacking in having a support hero that plays the role of a tank/healer that would make Isengard a little more viable on that front. I don't recall which BFME 2 mod that had Ugluk in there, it might have been the Edain mod, (or the Third Age Mod maybe), but anyways Ugluk had an ability that was called "Orcish Medicine/ Orcish Draught" and he naturally had a lot of armor and was the tank for the faction and was great as a troop support leader as well. I don't know what the team feels about heroes and determining what abilities they get, but I would think that an adaptation or port of that version of Ugluk over to the Reforged Edition, of course granted they get the proper permissions and everything from the original mod authors. Since Lurtz is an allrounder with abilites that are designed to be useful against enemy heroes and useful for your own troops, I'd generally design ugluk to be useful against enemy units and boost your own heroes. This would just round up the Isengard hero roster very well. And ugluk should definitely fill the role of a more tanky fighter, since lurtz is quite squishy. Considering his role as a horde fighter and hero supporter. One skill should definitely revolve around his most famous quote in the movies: "Meat's back on the Menu, boys!" I dont know the restrictions of the engine, but maybe make it sorta work like stimpaks in Starcraft II. For example units or heroes gain damage/armour/speed in exchange for sacrificing a third of their health or unit size? Maybe something along those lines. I'd also make this either his first or his lvl 10 skill. One more skill could revolve around giving your master what he asked for. If we consider Ugluk brining Pippin and Merry to Isengard Saruman wouldn't be all powerful but would've surely been able to learn a great deal in maybe torturing them. Maybe make Ugluk being able to grant an allied hero experience or if used on saruman give him more vision on the map? Not very flashy but would be very useful. One skill should revolve around being able to summon stuff. 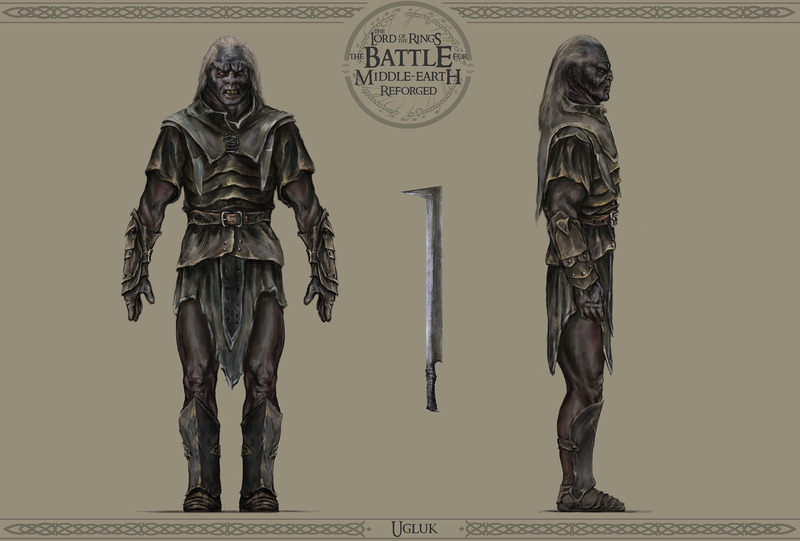 Maybe those orcs or other uruks, just make him useful against enemy units. You could get creative here. Maybe give him one Skill that lets him do area attacks which get progessively more powerful and wider as he gets to lower health as he ferociously fights to do his masters bidding? Hope any of this was useful to you guys. I wish you best of luck and would love to support you in any way possible! Really looking forward to seeing all this in action! -Bill Ferny who was half-orc and a known agent of Saruman, as such he could be a spy, and just like Eowyn, have that ability that would grant him a disguise. -Lotho Sackville-Baggins, a Hobbit that worked with Saruman and who took over the Shire. He industrialised it and thus, he could have some abilities linked with the control of crowds and with the evil machinery/devices of Isengard. As an evil hobbit, he would be quite original and would show the spread of Saruman's influence. Last edited by Mobbelkotze on Tue Dec 04, 2018 11:48 pm, edited 2 times in total. Are there any other new heroes you guys are considering adding to the game? I have no idea how long it would take to create them from scratch so don't create more work just for the sake of it, but the Dwarves could do with another hero like Thorin, or maybe even Beorn since he's linked to them from the Hobbit book? Side note; thank you so much for doing all this, the whole team is putting more effort into interacting with viewers than any major developer seems to! "LOOKS LIKE MEAT IS BACK ON OUR MENU, BOYS!!!" I agree with whats being said so far as Ugluk being the tank/support of Isen. Possibly having abilities similar to those of Dain in the Dwarven Faction. Allowing Ugluk to heal nearby troops or summon a guard. i think it is cool that Isengard is mainly an infantry civ, Ugluk was a leader of a group, not a superhero. He was killed by an avarege rohir, So i think he should be a cheap, earlygame hero, weaker than lurtz. Also he's got some great soundbites from the Two Towers, so if you guys can fit those in that'd be awesome.